The most common cause of household fires is an unattended stove or oven. 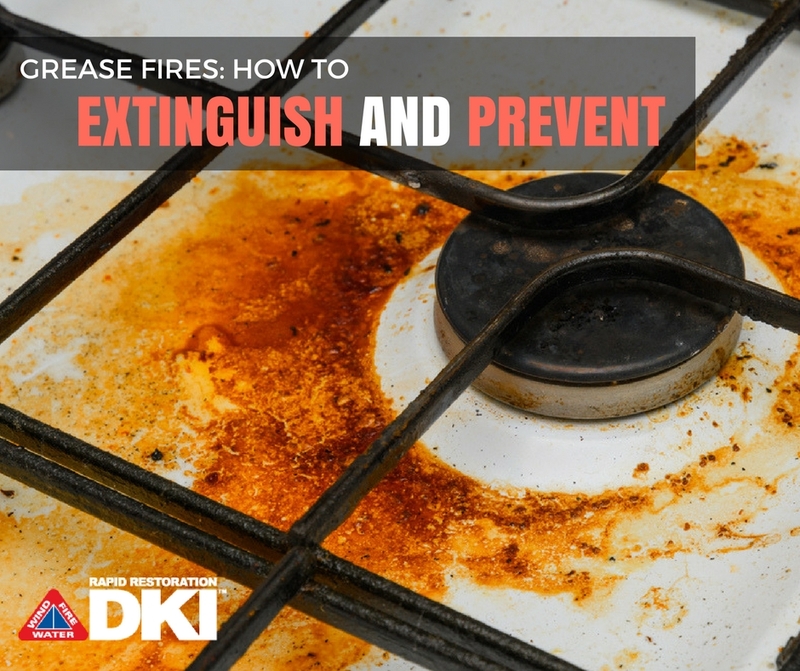 Kitchen fires can cause massive damage and panic, but if you’re prepared for it, you can easily put the fire out, lessen the damage from the smoke and flames, and know how to prevent future fires. One of the most common types of kitchen fires is a grease fire. Grease fires happen when oil or grease gets too hot while on the stove or in the oven. A common sign that your grease is about to catch on fire is if it starts to smoke. Once that happens, act fast. Remove the oil from the heat and turn off the stove. If you were unable to prevent the fire from starting, here’s what you should do to put it out. No matter what, DO NOT put water on the fire, as it will only make the fire spread. Smother the fire with a pan lid. Slide the lid over the flames rather than coming from the top. Use a metal lid instead of a glass lid, as the glass will most likely shatter if used. Smother the pan with a wet rag or towel. If you don’t have a pan lid nearby, you can use a wet rag or towel to smother the fire. If you choose this method, make sure your rag is damp, not soaking wet, and also make sure the cloth is thick enough so it won’t catch on fire too. Turn off the burner and let the pan cool naturally. Once the flame is smothered, move the pan off the source of heat, if possible. Don’t try to rush the hot pan outside to let it cool off as you risk splashing hot oil on yourself and spreading or starting the fire. Throw plenty of salt or baking soda on the fire. DO NOT throw flour, baking powder, or any other common baking ingredients on the fire. Want an easy way to remember how to put out a grease fire? Print this little guide and put it on your fridge! If you want to minimize the damage from a grease fire, knowing how to put it out right away will lessen the damage and make a grease fire less scary. What if the Fire Can’t Be Put Out? If the fire is too big to safely put out, alert your family and get out of the house. Close any doors on the way out to prevent the fire from spreading, and call the fire department immediately. To best fix the damage and remove the smell of smoke from your home, contact a restoration company. Not only can they make cleanup easy, but they can remove any residue of smoke and damage. Never leave your stove unattended. If you’re frying, baking, or heating up any form of oil or grease for cooking, make sure that you’re watching the stove at all times. Clean your stovetop before cooking. When cooking, make sure that your stove is free of food and oil. If there’s oil on the burners even before you start cooking, it’s much more likely something will catch on fire. Keep your oil from getting too hot. If your oil starts to boil or smoke, chances are it’s too hot! Immediately remove the oil from heat and wait for the oil to cool before using it to cook. If you’ve burned your oil, just throw it out as it will make your food taste burnt. Don’t leave your cookbook next to the stove. In fact, leave anything flammable, such as paper towels or dry rags, far away from your stove. If your oil gets too hot or water gets into the oil, the oil may splatter onto something flammable, which could also start or spread a fire. Note: Preventing a propane fire is different from grease fires. You can learn more about preventing a propane fire here. Has a Grease Fire Damaged Your Home? Has a grease fire damaged your kitchen? Rapid Restoration can help you get your kitchen back to how it was. We can remove any trace of smoke and fire damage, no matter how big or small the fire was, so you can get back to cooking as soon as possible! You can learn more about what to do in the case of fire with our complete guide!